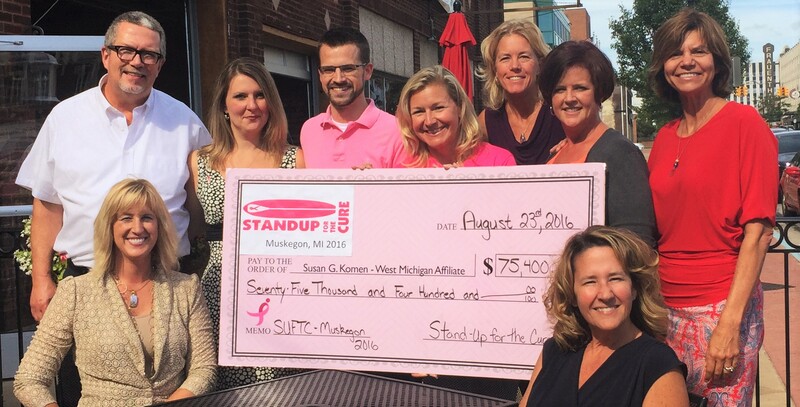 You are here: Home » Standup for the Cure Continues to Make Strides in Muskegon and Across the Country! The second Annual Standup for the Cure, Muskegon, hit the beach of Harbor Towne on Saturday morning to help continue the fight against breast cancer. The standup paddle board (SUP) event is organized to help support the local affiliate of Susan G. Komen Michigan®, an organization dedicated to ending breast cancer forever. Support was strong with 540 registered paddlers getting into gear for the 5K race on Muskegon Lake. Last year’s event raised over $65,000 and this year’s fundraising has netted $75,000 bringing Standup for the Cure’s total to $820,000 since inception. Every $125 raised covers the cost of a mammogram for a woman (or man) in need. Mercy Health was present to help with free screenings and to walk attendees through the process of getting checked. Ninety-nine percent of breast cancer is preventable if caught in its early stages, according to experts. To view the photo album from the event, click here. (SUFTC) is a 501(c)(3) Non-profit whose mission is to raise money and awareness for early breast cancer detection, research, treatment and education through the active, healthy lifestyle of Standup Paddling nationwide. Founded in 2011, Standup for the Cure is fully supported by generous donations from their partners and global community. To date, more than $820,000 has been raised for early breast cancer awareness, research, treatment, education and helped hundreds of underprivileged or uninsured women obtain life-saving treatment for their disease.